Planning a Trip to Seattle With Your Dog? You are here: Home / Planning a Trip to Seattle With Your Dog? I’m very fortunate to live in Seattle, where the mountains, sparking water, and lush green forests are plentiful. Seattle is also one of the most dog friendly cities in the country! 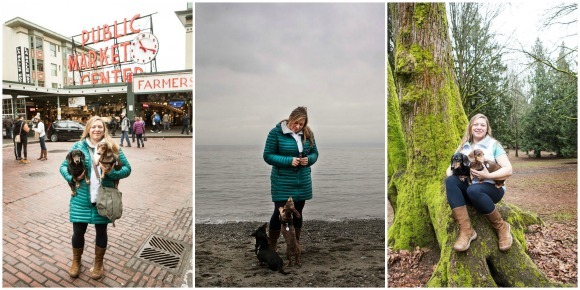 With more dogs than children living within the City limits, and pet parents in Seattle treating their kids like family (as I am sure you do if you are bringing them on vacation with you), Seattle is a dog-lover’s paradise. If you are in the middle of planning your dog friendly vacation to Seattle, or you are just starting, I want to help you out. Love hiking with your dog? I’ve written about many of the beautiful dog friendly trails near Seattle. Want a local’s “insider tips”? I’ve lived in Western Washington my whole life and have written about many places to visit, and things to do, with your dog in and near Seattle. Feel Overwhelmed? Don’t Want to Miss the Best Parts? You’re probably done a lot of research on your visit. But you know how travel articles and websites are. They only show you the best photos (yeah, most of us will never be able to see something the same way with our own eyes) and tell you about the good stuff. Instagram photos are notorious for “tricking” people like that. Do you want to know what it’s really like from a local’s perspective? In almost all cases, I’ve either been the place, can go check the place out for you, or know someone who has been to the place I can ask. Another thing… maps are deceiving. I’ve had many people email me their travel itinerary and I think “Great choices, but yikes! Do they know it takes 3 hours to drive from here to there? ?” It can be really disappointing when you have a list of 10 things to do but can only get to 5 or 6 of them before you run out of time… and then you find out the 10th thing on your list was way cooler than the 5th thing! May you and your pup have the best time in Seattle!